Self leveling cement underlayment material systems. Polished self level wear topping materials. Floor leveling and patch systems. These self leveling underlayment materials are used with a variety of finished floor goods such as carpet, VCT, sheet vinyl flooring, engineered wood floor systems, and other floor materials. Restore old concrete with a fresh polished self level wear surface material. 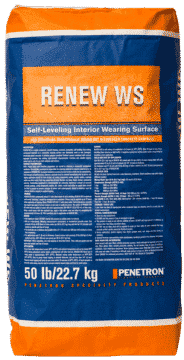 RENEW® WS is a premium, fast-setting, Calcium Aluminate, polymer modified, cement-based, interior, self-leveling topping that is used as a restorative wear surface over distressed, worn or damaged, structurally sound concrete. Available in gray, white and ultra white. Environmentally friendly. May be LEED eligible. NOTE: Above 85°F (29°C), use ACI Hot Weather Application Guidelines. Cure time @ 73°F (23°C): Accepts floor covering, polishing, resinous coating/toppings or light traffic in 24 hours. 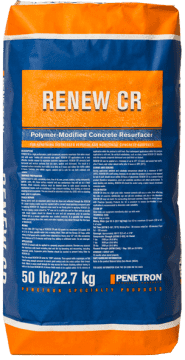 RENEW® CR is a high-performance, polymer-modified, cement-based concrete resurfacer that makes old concrete surfaces new again. It corrects both interior and exterior horizontal and vertical surfaces that are worn, spalled, damaged or distressed. Available in gray and white, RENEW® CR is stainable and can be integrally colored, offering many unique options for both old and new concrete. Mixing water (per 50-lb (22.7-kg) bag): Use 4.0 to a maximum 5.5 quarts (3.8 to 5.2 l) of water. Cure time @ 73˚F (23˚C): Accepts foot traffic in 2 hours, light rubber tire traffic in 8 hours and full service in 24 hours. NOTE: Cooler temperatures, inadequate ventilation and higher humidity can extend drying times. All data derived from tests under laboratory conditions; field conditions may yield slightly different results. 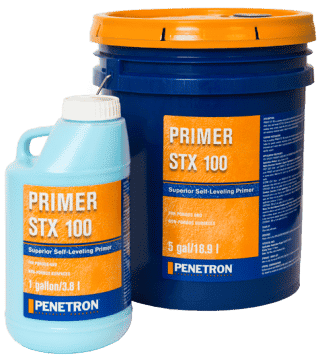 PRIMER STX™ 100 is a premium concentrated acrylic primer for use over various interior substrates, including concrete, sheet vinyl, well bonded VCT/VAT, cutback adhesive residue, gypsum underlayment, terrazzo, epoxy floor coatings, wood, ceramic, quarry tile, and metal. Its unique ability to bond to both porous and non-porous substrates makes it ideal for varying jobsite conditions. PRIMER STX™ 100 is very easy to use; it creates an extremely tenacious bond to the substrate and reduces surface porosity.